So I was staying with my parents! And my mum loves to cook for me. SO SHE DID. Not heaps, because I was only in town for almost but not quite five days, but every cooking was a delight. Because we're super Malaysian, it was mostly curry. And that's totally okay, because my mum makes some really great curries. 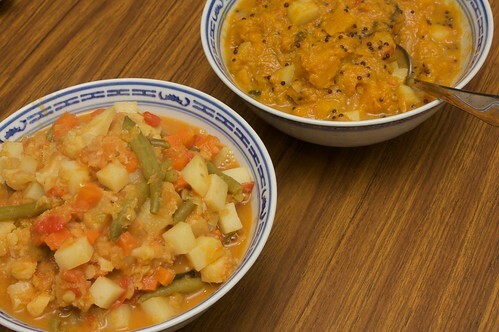 On Saturday night she cooked a pumpkin curry and a mixed-vegetable curry. OH YEAH. On Tuesday, I was concerned that maybe I would be eating bread all day (toast, then sandwiches, then more sandwiches on the plane), so my mum cooked me a delicious eggplant curry for lunch. There's something about a good eggplant curry that's just really awesome. Done well, the eggplant falls apart and is all squishy and kind of fatty, and it soaks up all the flavours and it's delicious. And my mum does a good eggplant curry. Which I am going to attempt to share with you! I say "attempt" because I sort of kept looking over to see what mum was doing, but my mum very rarely actually measures things out so it's all a bit of guesswork. Just go with what works best! Slice a couple of Lebanese eggplants lengthwise into strips. They don't have to be super thin. In a little bit of oil, fry these until they colour, then set aside. You'll add these in again at the end. Pound together two large shallots and three large red chillis, and in the remaining oil, start to fry this. As it becomes fragrant, add some water and two lengths of lemongrass. 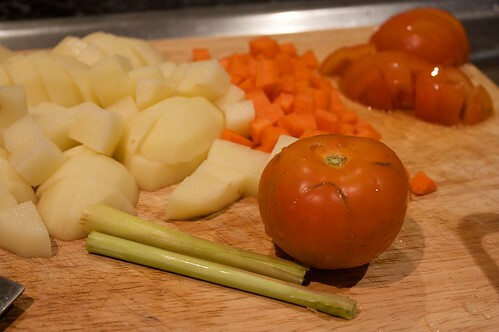 After five to ten minutes, add two diced potatoes, one diced carrot, and two diced tomatoes, as well as some fresh beans (if you're using them - or add them in ten minutes if you're using frozen). At this point, also add a bay leaf and some fresh lime kaffir leaves. Add some more water, and some garam masala (you will need to make your own if it needs to be gf), and leave to boil, lid on. My mum has a lime kaffir tree, and at this point I'm pretty sure I stared at it, longingly. After twenty or thirty minutes, the vegies should have softened. Add one small can of coconut milk, and the eggplants. Leave to simmer, lid off, for another ten to fifteen minutes. I've been to Chatters once before, in Morley. It was a perfectly serviceable visit, though nothing special: Australianised vegetables, a reasonable char kuay teow, terrible spring rolls. So as it turns out, on weekends you can get a moderately sized yumcha menu at Chatters. Having just had a fabulous and gigantic brunch, I was not especially hungry, so as I joined my mum and my sister for a late lunch I slowly perused the menu. And broke a glass. I managed to get four dishes, three on the menu and one off, and this was more than enough food for me, even with my mum sampling everything. In fact, I had to take some home, for breakfast the next morning! It's okay, this was no great hardship. 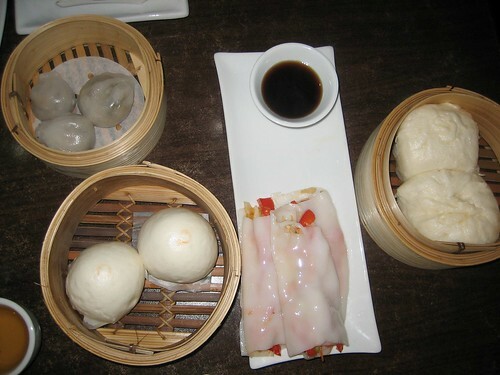 From the menu, I ordered the vegetable bao and the mushroom dumpling. My mum decided to order the lotus paste bao, because she loves lotus paste. These required no mods, being already vegan. My sister was eyeing off a meaty chee cheong fun, so I convinced the staff to do one for me, animal free. The staff were very helpful, but they did advise they'd never done one animal free before, so it was going to be very experimental. The best of these four dishes was the vegetable bao. The bao itself was light and fluffy, and the filling was warm, fresh and tasty. 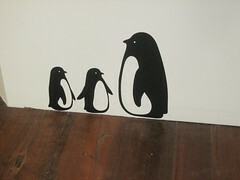 I accidentally ate the paper on one of them (yucckkk). A rookie mistake. The mushrooms were also pretty good, and crunchy with water chestnuts. The lotus paste was ok. The chee cheong fun was heavy. My mum did a comparison taste test, and the noodles of the meaty cheong fun were definitely lighter, which was odd. The vegetables were cut too thick, so didn't cook all the way, and you don't want crispiness in the middle of the chee cheong fun! Still, points for effort. Maybe they could work on it, or something. Anyway, not the greatest yum cha ever, but nice to have something to eat. My favourite place to have brunch in Perth is Source Foods. They know what vegan means (they call it 'NAP' - No Animal Products), which is rare enough in Perth; and they serve tempeh, which is also pretty unusual. Anyway, it's my favourite, so Alexa and I went there on Saturday morning. We took advantage of the lovely Perth weather to sit outside. Usually in winter I find it too cold to sit outside in Perth, but one winter in Melbourne and suddenly it is glorious! I didn't even have to wear a scarf! Or a coat! It was amazing! I ordered, as I have many times before, the vegan heaven: tomato, two (two!) 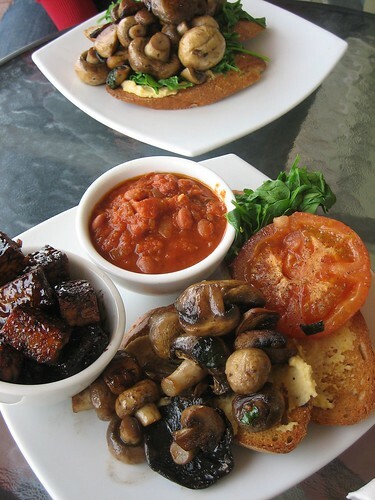 types of mushrooms, wilted spinach and baked beans, served on crisp bread with hommus. I also ordered it with a side of soy-marinated tempeh. It was so amazing. SO AMAZING. I ate it all up. Alexa ordered the mushroom crostini, mushrooms with wilted spinach on hommus and crisp breadishness. She was indulging in mushrooms in her mushroom-hating housemate's absence. Not pictured: our juices. Alexa ordered orange + ginger, and I ordered the 'zinger,' which contains orange and ginger and asomething else that I can never remember, maybe apple. After brunch we went adventuring: to North Perth, where we visited Little Design Horse; and then in to Mount Lawley, where we visited Planet, primarily so we could visit the greatest bookstore in the world. 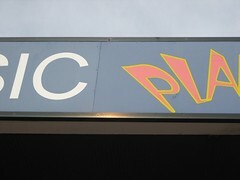 I know some people prefer Oxford St Books in Leederville, but I can never go past Planet. I got off the plane, collected my luggage and my mother, and the first thing we did after leaving Perth Domestic Airport was head in to Northbridge and be Very Chinese. We went to visit the aunties* at the Chinese grocers along William Street, where I had to say hello and 你好吗** and yes Melbourne is good and 四日***. I eyed off the Mister Potato Crisps and the mooncakes, but decided I could wait until I got back to Melbourne. I also wandered up and down the aisles whilst my mother did some shopping, lamenting the loss (to me) of my favourite Chinese-Malaysian grocer. As I have well documented, I have yet to find every Malaysian thing that I require from Melbourne. 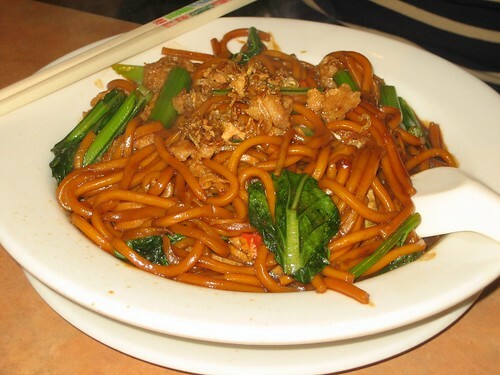 We then moved on to be more Chinese-Malaysian, with lunch at Lotus. Oh Lotus. I have loved you frequently and loved you long, as the only provider of vegan Nyonya noms in Perth (aside from my mum). I remain so sad that there is no equivalent to you in Melbourne. I used to visit you several times a month, to eat the comfort food I love; your 'beef' rendang and your laksa and your kapitan and your char kuay teow and your deliciousness. Oh yeah. Danni's mum joined us, and we had a bit of a noodle extravaganza. 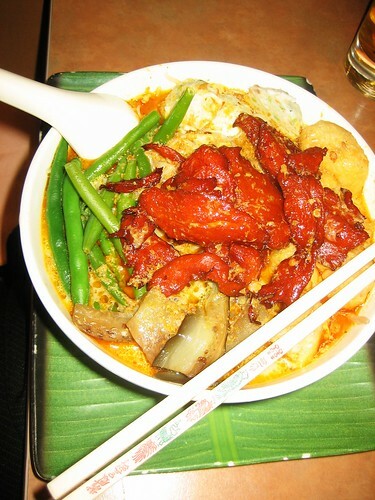 My mother went for the Penang Laksa (please forgive the overexposed shot). This was very rich, as always, and filled with lots of beans, tofu, and mock char siu, and my mum had it with beehoon (rice) noodles. It was good, but not super spicy, and she didn't finish it all. Danni's mum went for the Hokkien Mee. Hokkien mee is one of my favourite things to cook, it is quick and easy and delicious, and so must this one have been because she ate it all up (and did a stellar job with her chopsticks). This was filled with lots of vegies, which is just the way it is best. What is with all this single dishes? perhaps you are asking. 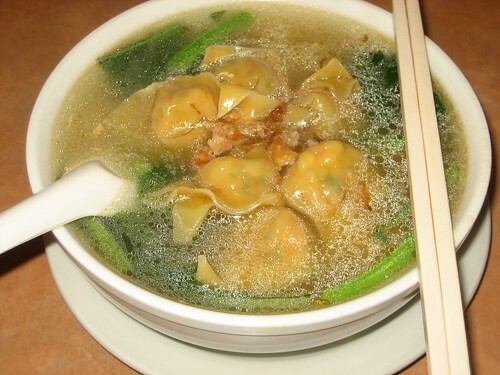 Well, it is my fault, because I knew exactly what I wanted, and what I wanted was the wonton mee. Whilst I had a perfectly reasonable wonton noodles at Tinh Tam Chay in St Albans, it was not perfect, and what I really wanted, above all else, was the wonton mee soup at Lotus. It's not on the menu, but you can ask for it and oh yeah. Oh yeah. LOOK AT THAT OIL. I drank that all up. Delicious. I picked this over all my other favourite dishes at Lotus, and it was totally worth it. 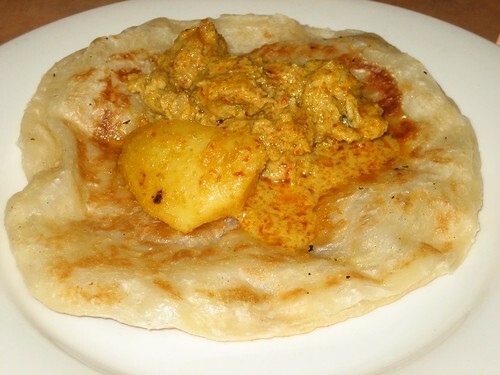 Finally, we ordered a kapitan + three roti to share. The kapitan ('chicken' curry) was super spicy. My nose started running and my tongue was burning, but OH WOW. DELCIOUSNESS. Totally perfect, oh how I have missed it. Oh Lotus. If only you were open on Mondays, I would have had lunch at you again yesterday. And I would have eaten the satay. And the fried wontons. And the Assam fish. And the char kuay teow. And and and. I would like to talk about breakfast! 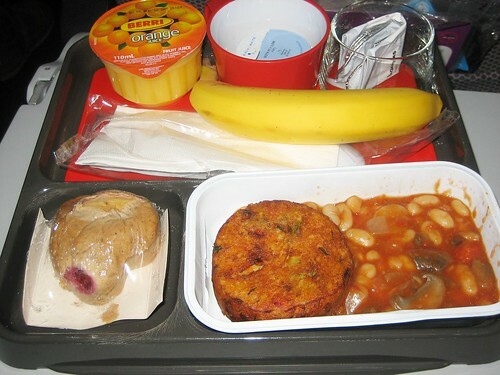 My rosti, though I was excited by the peas it contained, was bland. Not big at all! The beans were ok, again, not big in flavours. I would like some variety in my muffin, it is always the same berryful. Also the banana was underripe. Thank you for the juice. In addition, I'd like to address the matter of the options available to those who did not order special meals. These were given as scrambled eggs or cereal. This was the only description given to anyone. Perhaps some further explanation is required, as you served the lovely Muslim woman behind me the scrambled eggs, which upon opening she had to return, as the eggs were thoughtfully served with bacon. Perhaps you might have mentioned this to her, since she was wearing her headscarf, which I know you noticed. Also, the smell of bacon. Wow. I find that pretty confronting. Not my favourite way to spend half an hour. At least there was no-one directly next to me. TOO many tasty sausages almost killed this kookaburra. But health worries weren't the threat. She became so obese from barbecue handouts she could not fly when attacked by dogs in a Mosman park. THANKS, HUMANS, is what the kookaburra should be thinking. Animals Australia: Exposing poultry's dark side, a broiler chicken investigation. An investigation into one of Australia's largest chicken meat producers that supplies major retail outlets has revealed routine and shocking animal abuse. Every year in Australia 488 million chickens endure brutally short and undeniably cruel lives inside factory farms. Animals Australia's investigation video shows baby birds suffering from heart disease, lameness, thirst, starvation and trampling inside a shed packed with over 40,000 birds. Telling An Old, Old Story: Animal Cruelty and Human Violence at This Ain't Livin'. At the Huffington Post, Veg and the City: My Beef With Locavores, on the growing anti-vegetarian component of locavoreishness, and what that means. And Be Happy About the Octopus, about Paul the Octopus and how he started receiving death threats, and what that means. I finished reading Eating Animals, and I have plans to watch Food, Inc this week. So more on those soon! My preference, when I'm at work, is to bring something from home, leftovers from the night before or something. 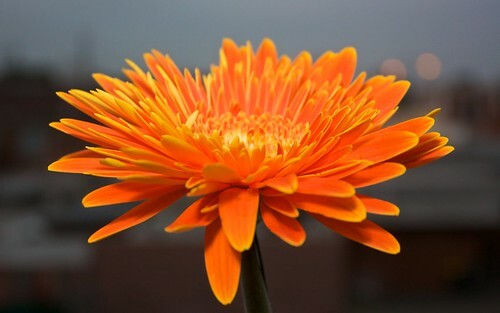 But sometimes that's not possible, and at those times it's handy that there are some possibilities around. I've tried Penang Coffee House (not good enough for a repeat), and High Tech Burrito (totally delicious). But my favourite might well be Gujju's Cafe and Chaat House, which is nearly the closest restaurant to my office. 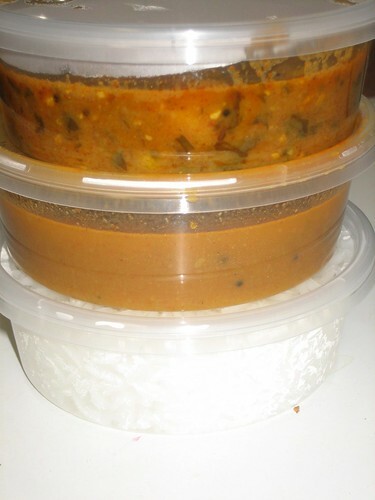 For $5 I can grab two curries from the bain marie and some rice, and this is sufficient for a filling lunch. On the day of this photo there were four totally vegan options; I went for a yellow dahl and a cauliflower and potato curry. Cheap and easy and delicious! There is also Gujarati Rasoi around the corner from Gujju's; it is also vegetarian and apparently cheap and delicious, and I plan to give it a go soon! 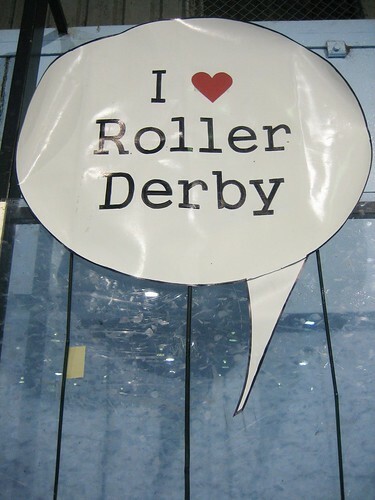 On Saturday Jo, Em, Danni and I joined K and Toby and two of their friends at roller derby. Well, maybe they joined us. Or something. WE ALL WENT TOGETHER. Derby bouts are always a bit epic, having to stand in the queue for a million years, elbowing away for space, having to put up with the smell of sausages and really bad toilets, but this one was twice as epic, because there were two bouts, starting at five and finishing about nine. RIGHT OVER DINNER TIME. So we prepped up with goodies. I made some rice balls. There were more than featured here! I basically smushed together some cooked rice with some tomatoes, a little bit of onion, some herbs and some mashed chickpeas. Cashews would also have been a good addition. Then I baked them for a while, until they were golden. Seen here with some sweet chilli sauce that Vicki left at my house and I keep forgetting to give back. 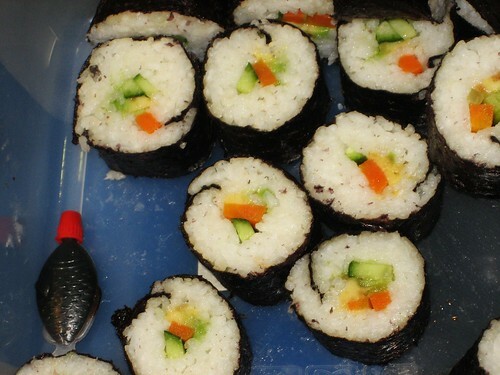 Jo made some sushi. Mmmm sushi. Em made some citrus cookies, that were light and fluffy and kind of like eating cake. 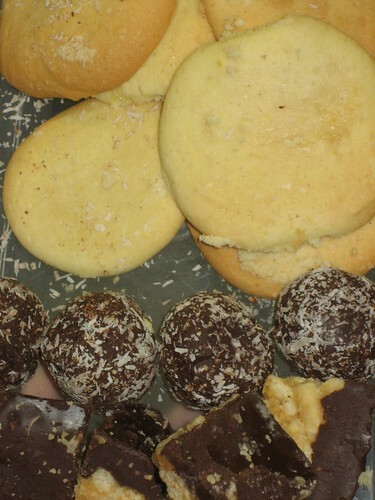 CAKE COOKIES. It's like a world of revelation. K made some of Cindy's peanut butter rice bubble chocolate slice things, maybe one of them will link me to the recipe (I always seem to be saying that lately...). These were delicious! Whilst I was at friends of the earth earlier in the day, I picked up some raw chocolate truffles to go along with the snacks. Bringing food makes it a lot more fun! Yay! Sometimes it is not I baking treats for people; sometimes people bake treats and give them to me! This always excites me, because, as I have mentioned before, I like eating things. A lot. I especially like baked things, because good vegan baked treats can be so hard to find. So it is a delight when people turn up and give me a container of baked treaties! This post contains things baked by Jo in recent weeks, that I have eaten. Jo baked a lemon and lavendar slice for the Aussie cookie swap (which, incidentally, has a number of vegan participants, so you should join!). This was very lemony, and the lavendar was really subtle. It was delicious, but very sweet! I could only have a tiny bit at a time. Also delicious was this apple cinnamon cake. 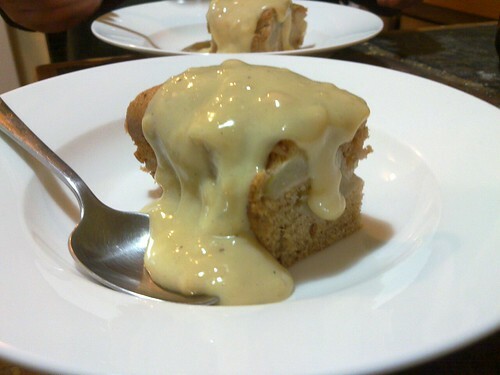 I'm not sure if it was intentional, but it was kind of smushy and pudding-y in the middle, and a little bit dense and gooey, which made it really fun and tasty to eat. I would like to make this cake! I would upload or link the recipes, but I appear to have lost them! SAD FOR ME. I used McVities digestives instead of Granitas, and instead of .5 cup sweetened condensed milk I used .25 cup soy milk and .25 cup sugar. 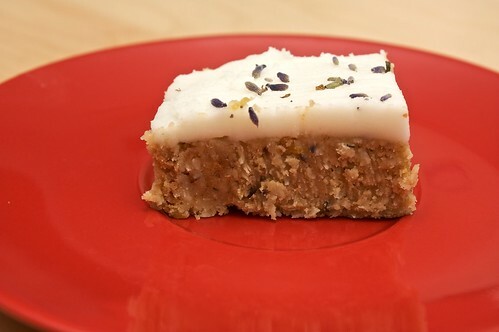 Plus, I added dried lavender - I put maybe two tablespoons into the base, then some sprinkled on top of the icing. In the icing, instead of butter I used equal parts Nuttelex and Copha, so it would set more solid than just with margarine. But instead of canned "apple pie filling" I just cubed some apples, sprinkled a little sugar over them, then microwaved them until a little soft, before using. I also used a lot less of the sugar+cinnamon on top of the cake. We only recently-ish bought a panini grill. We left our jaffle-maker behind in Perth last July, on the grounds that it was old and skanky, and picked up a cool new press a couple of months ago. 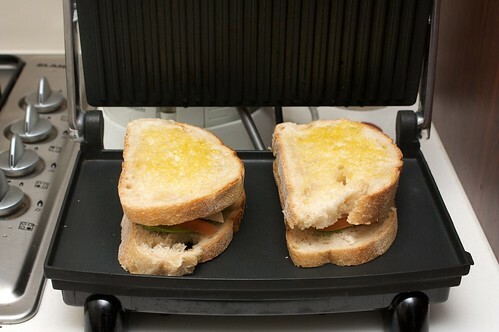 The downside of a press is that I can't put baked beans in my toasties. The upside of a press is that FOCACCIAS AND SOUR DOUGH AND TURKISH BREAD OH YEAH. Danni, since she works at home, gets most of the delicious toasties, on the grounds that she can make them more often. And then I get jealous when she IMs to tell me about them. Featured here is avocado, roma tomato, smoked tofu and cheezely, with sour dough brushed with olive oil (we had run out of nuttelex). Smoked tofu in toasted sandwiches is EXCELLENT. I highly recommend it. 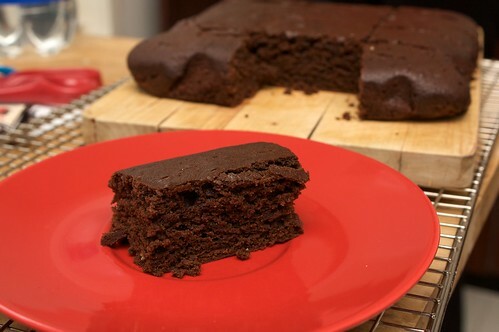 I am, as previously blogged, on a hunt to find a decent brownie recipe. Of course I would prefer the BEST MOST AMAZING BROWNIE EVER, but given my repeated failures I would, at this point, settle for merely a decent brownie. I recently tried the brownies recipe from The Complete Vegan Kitchen, pg 300. This book has been one I've not used that often, which I'd like to change. So I gave this brownie recipe a go. It calls for 'half a cup of very hot espresso,' which I think I increased just because I used the moka pot to make some coffee and poured it all in, ended up being about three quarters of a cup. I also used a cup of coconut sugar, which is the MOST DELICIOUS SUGAR IN THE WORLD, instead of white or brown sugar. It tastes like Milo. I also made a few other tweaks, so I reproduce the recipe with my mods below! I thought the brownie was good, but needed more chocolate; Danni and Jo both pronounced the brownie good, but needed more coffee (they're wrong). Whisk the coffee (very hot!) with the sugar and cocoa and chocolate, then add the vanilla extract and oil and combine until it's all smooth. Add the flour, baking powder and salt to the wet ingredients, gradually, until just combined. Bake at about 175C for 30 minutes. I recommend a square tin that has been lined or greased. Let it cool for a bit in the tin before removing and cutting. I am not very good at making hommus or felafal. I am yet to successfully do so - usually I just get Gen (at FoE) to make it for me. But it turns out what I really should be doing is getting Jo to make it for me! Even though it has been really cold, we somehow decided on one particularly chilly evening that we'd have what is effectively summer food. Jo made some hommus and some felafal and a mushroom and capsicum salad, and Danni spent an age chopping parsley for a taboulli. 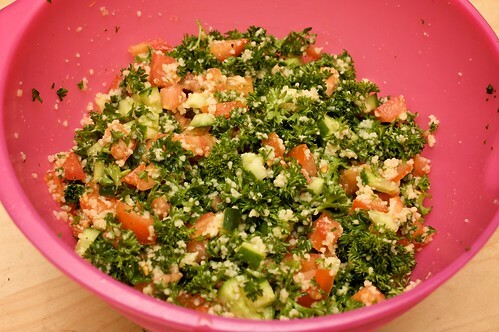 Which, in interesting news, I should note that I don't usually like taboulli, it usually makes me feel sick, but this one I had no problems with! So that was exciting (and delicious). It's funny how rarely we engage in Middle-Eastern noms, given where we live (...an area very heavily populated by Middle-Eastern restaurants and grocers...50m from my front door I can buy hummous in a can. HOMMUS IN A CAN). 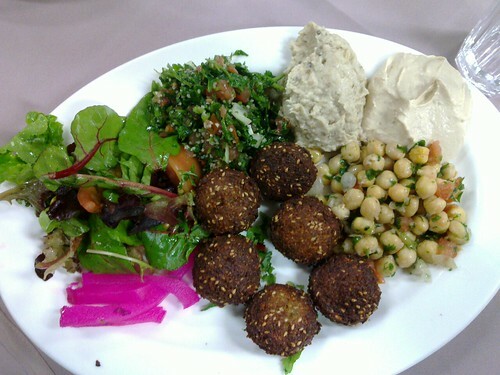 Eating this meal, and Danni's recent visit to Tiba's, reminded me how delicious and easy this food can be. And also I bet it is really great picnic food. Mmmm hommus. Maybe this post will get updated with a recipe. Or maybe not. 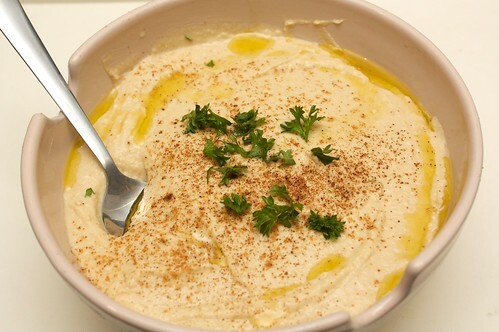 Maybe you will all just have to ask Jo over to make this hommus for you. Sometimes, ninja vegan food appears in the oddest of shapes. The most intriguing of recent weeks was these chips my friend W found when she was cruising her local Chinese supermarket (I believe it is in Glen Waverly). She too is Malaysian-Chinese, having resided in Australia lo these many years, and she couldn't go past the idea of a Malaysian Curry chip. Now that I look at this poorly framed photograph, I realise I left out the most important part - the Jalur Gemilang (Malaysian flag) border around the top! That's right, these 'Malaysian Curry' chips were in fact from Malaysia, all the writing around the back was in BM (bahasa malaysia, the national language) and everything. And yet. 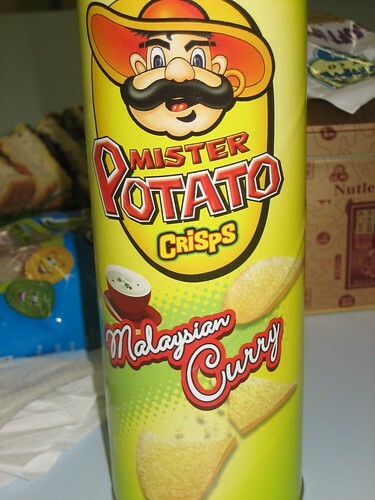 'Malaysian Curry.' I don't know. BUT HOW COULD WE RESIST. These were interesting. They had a little tang, and a really tiny blacan after taste. But mostly they tasted like pringles. In non-accidentally-vegan news, don't buy plain samboy chips from a vending machine when you're really hungry and it's the only thing you have time for. You'll pay your $2.50, only to discover there's lactose in them. And then you'll sulk. Went to Shakahari for dinner twice last week, and took nary a photo because I hate the lighting at Shakahari and can never take a good photo there with Toy Camera (the Ixus 55). 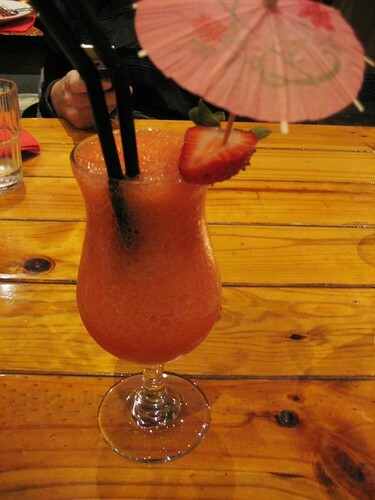 So here's a photo of a strawberry daquiri I had earlier this year; their seasonal daquiris are always super tasty and I often order one with dinner. Danni had the Nirvana, which was also pretty amazing. Fortunately for two visits in one week, the menu has changed since our last visit in April. The entrees and mains are now all vegan! And about 75% gluten free. Exciting! Over the last week, between the two of us Danni and I have tried the following (not their actual names): polenta triangles (gf); buckwheat flatbread (gf); lentil lasagna; malaysian curry thing (gf); pumpkin soup (gf except for the bread on the side); couscous de fes; tofu caramel (gf). Shared the polenta triangles and the flatbread between seven people as entrees. The flatbread came with a really nice pesto, I think there was tomato and chilli involved and it was delicious. The polenta was good, but a bit polenta grainy. I tried the puy lentil lasagna on Tuesday (it was my birthday). The flavour was fine, but I didn't really enjoy the use of the lentils - they didn't bind together at all, which I love in lasagna. It's not that the lasagna was bad, it's just that I don't think it was my thing. Em had the lasagna last night, and she agreed. Danni had the couscous de fes (maybe alla fes), which she described as good, but not spectacular. I had an entree soup upsized to a main last night, as I wasn't feeling very hungry. The soup of the day was pumpkin, sweet potato, tomato and chickpea, blended to a smooth soup. I was intrigued and slightly concerned by this combination, but it had a beautiful texture and a yummy flavour, and Danni was jealous. 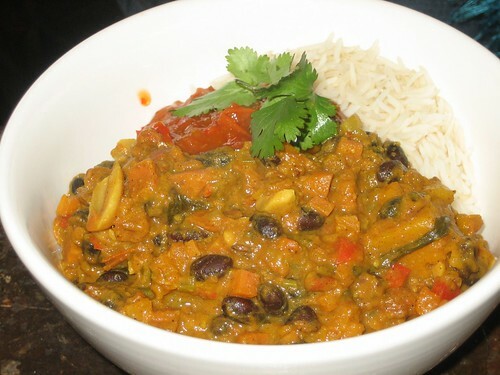 Danni ate the curry, it was a slightly sweet and spicy beany curry served with dahl, papadums and rice. It was tasty! I would order this. 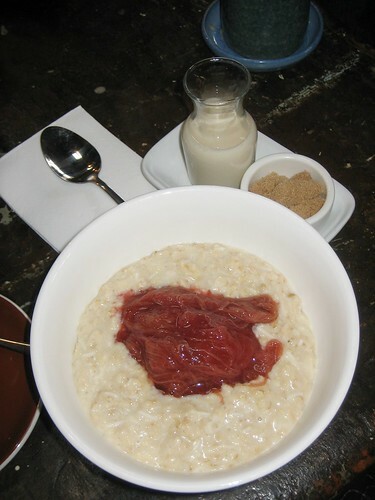 Other delicious things I sampled were the risotto + potato pot pie (gf) which was good but apparently really filling, due to the risotto; and the sago pudding (gf) which was exactly as it sounds. I would like to order the risotto one time. Recent shakahari visits one, two, zero, zero prime, three. Last week, while I was sulking around and attending my cantonese class, Danni went out for dinner at Tiba's, just down the road from our house. Danni ordered the felafal plate. She reports that it was very nice: the felafals were well made, and the and the hommus and babaganoush were nice. She's not sure what the bright purple things were, but they were tangy. 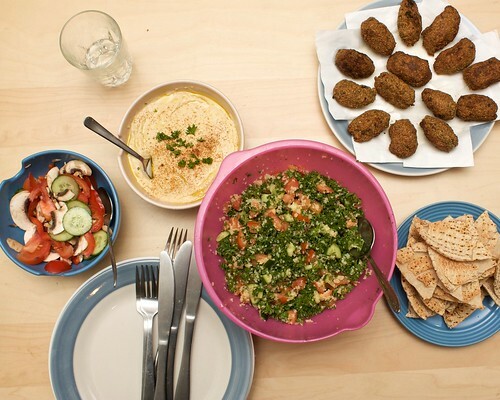 This meal usually comes with yoghurt, which Danni swapped out for the babaganoush. Also there was apparently heaps of bread to share, to bulk up the meal a little bit. Yet more good times in which I don't get to participate! Sad face! 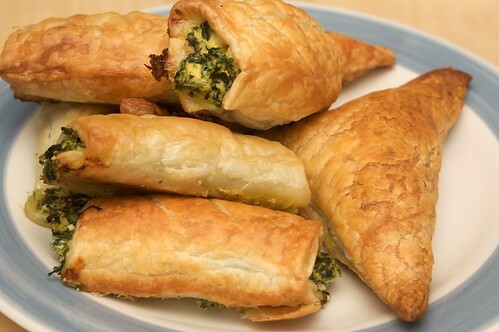 I had been thinking about these cheese and spinach rolls about which Carla posted. So I made them! They were super easy, and super delicious, though next time I think I might reduce the spinach just a tad. For reference, I used about 300g of tofu, which is about half a pack. Also I skipped the food processor - I found it easier to mix by hand. I made these as a mixture of triangles and rolls. So it turns out that everyone is in love with Monk Bodhi Dharma! I've been hearing about Monk Bodhi Dharma for a couple of months now, and everyone has had nothing but great things to say about it. We kept making plans and putting them off - we knew we had to go on a weekday, when we could actually get a seat, and coordinating work days is hard! 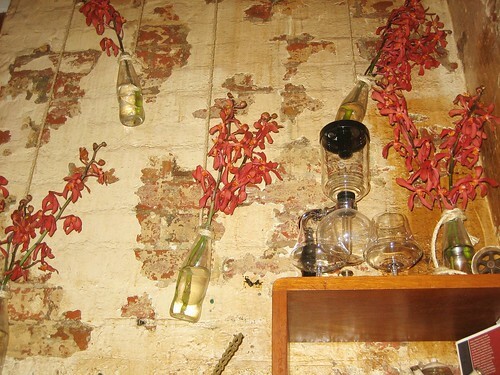 But finally, last Friday, we coordinated ourselves well enough to get on down to Balaclava. It was totally worth it. Eyeing off the vegan cupcakes (works of art!) in the display cabinet, we got ourselves a seat at the communal table. Whilst waiting for Jo, we ordered some coffees. Danni's soy latte was a little bitter, but still good. I ordered a soy chai. 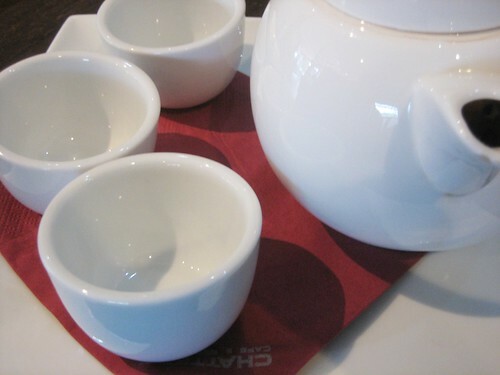 Please be warned - the soy chai, as it turns out, is not vegan! There is honey in the mixture. You have to specifically ask for a vegan soy chai (which Jo later ordered, and was delicious but a little less sweet than the non-vegan soy chai). AND THEN THERE WAS FOOD. Oh, the food. I ordered the vegan french toast with pears and pistachios and covered in some sort of caramelised sauce, and served with lemon cream cheeze. This was amazing. 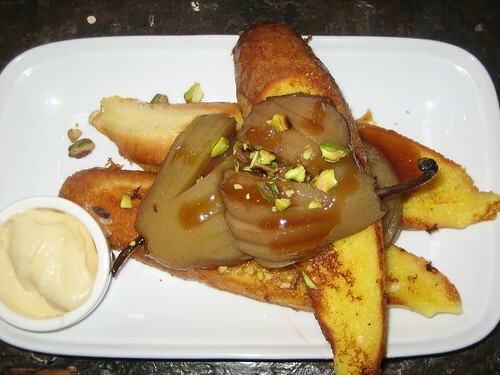 The toast spears were sweet and crisp, and the pears with the caramelised toppings were amazing. The cream cheeze was so sweet it was like the topping of a carrot cake, so I could only have a small amount. I really enjoyed Monk Bodhi Dharma - it was tiny and cute, and the service was nice, and the food was delicious. Shame it's in Balaclava, but I suppose I can make the occasional trek South for such delights. I had a bit of a break from the EBC, but now I'm totally back in to it again. Their specials haven't been inspiring me lately, but I'm very interested in visiting on a weekend to try out their breakfast menu, which Vicki said was pretty awesome. Three types of vegan pancake! Also, $12 jugs of beer with "breakfast." Not that I drink beer, but I think the EBC knows its clientele. ANYWAY, the last visit wasn't about breakfast, it was about dinner, after bawling my eyes out at Toy Story 3 (IT WAS SAD, OKAY. 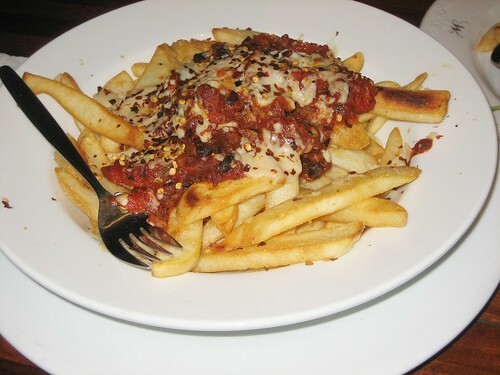 I AM NOT MADE OF STONE) ("THAT'S *MISTER* EVIL DOCTOR PORKCHOP TO YOU"), and it was about chilli fries. Delicious fries, covered in black bean nacho toppings. It was super delicious. It wasn't what I was expecting - I was thinking more of something like Trippy Taco's fries, but it was still two of my favourite things combined in one: potatoes, and nacho toppings. OH YEAH. EBC visits: one; two; three; four. 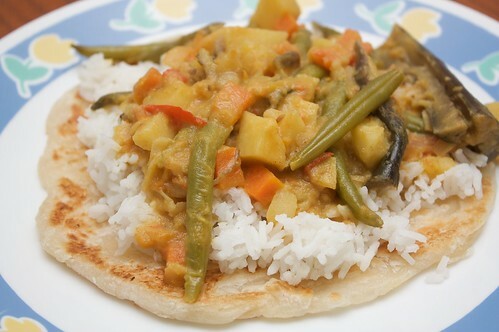 Casting about for ideas, I wanted some curry inspiration. Em, stuck ("stuck") in Singapore suggested that she would be cooking sayur lodeh for dinner, and maybe I too would like to give it a go. And indeed, I felt that I would. 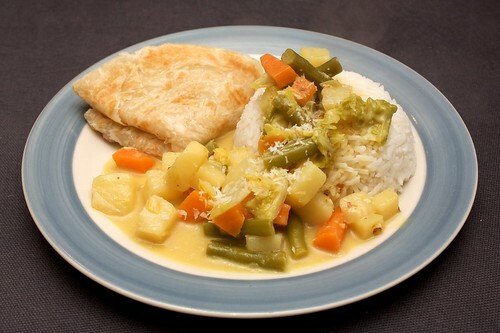 Sayur lodeh is a delicious, spicy coconutty vegetable curry, thick with gravy, from Malaysia. 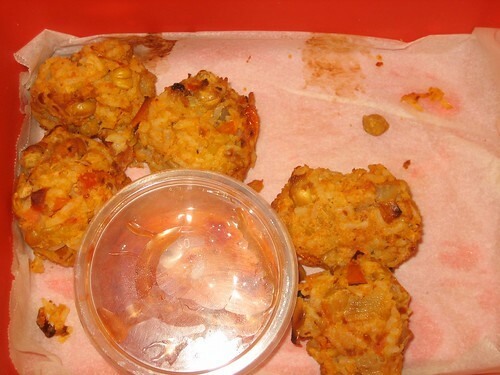 It is a traditional Malay dish, very tasty, and has an odd flavour that you can only think of as Malaysian. This, as it turns out, is the flavour of the blacan. Blacan, incidentally, is not usually suitable for veg*ns, being made from shrimp, but due to a heads up from Chris at Eurasian Sensation, I went on an expedition to Box Hill and discovered some vegan blacan there. It's made from soyabeans. What a surprise. This should be served with lontong, but I was too lazy to make it. Also lontong is an overnight affair. Maybe next time! For the paste, pound together all the paste ingredients. You can use a blender, but I find pounding more fun! For the sayur lodeh, heat some oil (peanut or vegetable) in a pot, then add the curry paste until it is fragrant. Add the water and coconut milk, bring to a boil, and add the bay leaves (and, if you are so inclined, some more fresh chillies). Reduce the heat, throw in the vegies except the cabbage, and leave to simmer for ten minutes. Then add the cabbage and the tofu, and leave until the vegies are tender but not falling apart. THAT'S IT. Garnish with shredded coconut. Serve with lontong, roti, or fresh steamed rice. Now that it's super cold, I'm really appreciating meals that have the oven on for ages! And so it was with great delight on Saturday night that we decided to roast some more things! On the way home from my FOE shift, Danni, Jo and I swung by the Radical Grocery, where we picked up treats (ie, chocolate) and a veggie roast. We elected to try the Redwood Cheatin' Turkey Roast with cranberry and wild rice stuffing, as we had already tried the beef roast and the turkey roast (no stuffing) the previous weekend at a friend's birthday party. This was an excellent choice, though it was quite heavy - we had one between the three of us, but it would probably work better between four or five people. This cooks best if it is wrapped in alfoil and roasted for ages (the same length of time as the potatoes, in fact), then left to cool for five minutes before carving. 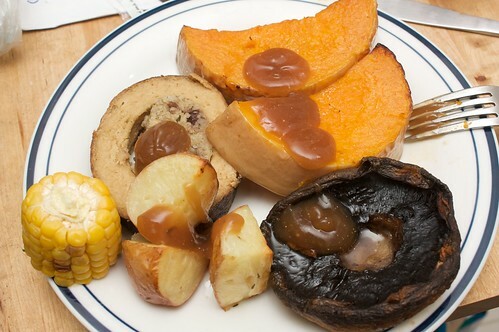 This we served with roasted pumpkin, field mushrooms, and potatoes, as well as steamed corn. Some of us (not Danni) elected to eat some peas as well. I love roast pumpkin. And roast potato. And roast mushroom. I like to put the mushrooms in the same tray as the pumpkin (much later than the pumpkin, of course), where they can slide about in the pumpkin juices. It is the best! This amount of food maxed out the capacity of our oven, and kept us in leftover roast vegies for several days. Dessert is not pictured: it was a pear + apple crumble, manufactured almost entirely by Jo, with chopping of vegiesfruits by Danni.